Where better to begin a storytelling project than with the people whom we heard our first stories from? The grandmothers who shaped our earliest worldviews exist still, even if some of these remarkable women live only in our memories while others have been overshadowed by the hurly-burly of Naya Nepal. Hamra Hajurama: Our Grandmothers is a storytelling project using the primary mediums of photography and text. It strives to inspi…re storytellers to go beyond the headlines to diverse parts of Nepal, and spend time with grandmothers with stories to tell. The project is designed by photo.circle, a platform for emerging and professional photographers, based in Kathmandu. The project kicked off in May 2009 with a series of meetings of seven photographers and six writers defining and discussing their craft and finding ways to collaborate. Over the following six months, they fanned out across the country seeking voices and encountering a fascinating range of women with much to tell, not just tales of sorrow and injustice. 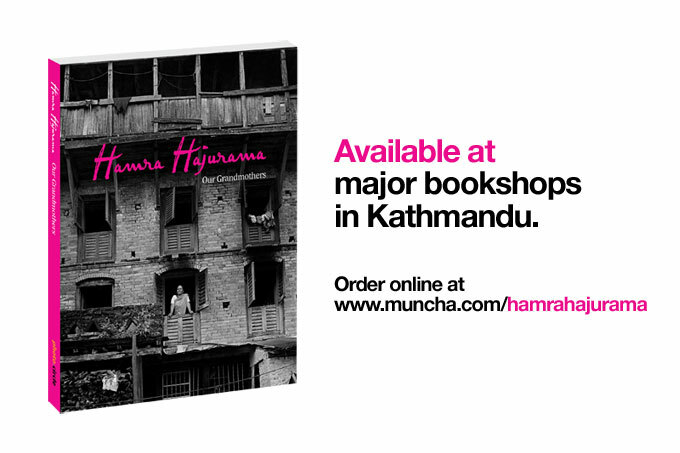 The results, in the form of a book and the accompanying exhibition, constitute a form of cultural journalism that encompasses the individual and collective histories and cultural practices of the Nepali people as a whole. It is our hope that Hamra Hajurama: Our Grandmothers not only encourages others to go out and document the living histories of our country, but also serves to foster a very real sense of how interlinked these histories are across the spectrum of ethnicity, class, culture and geography. This sense of history, of unity, will be crucial in the days to come for the future of Nepal.